Once you arrive at the International Airport in Belize, you can fly local airlines (Tropic Air and Maya Island Air) to most of the major towns and to the two most popular islands, or cayes, pronounced ‘keys’, Caye Caulker and Ambergris Caye. It’s pricey but for sure you save time. But if time is not of the essence, why fly? If you are going to one of the cayes mentioned above, take a cab from the airport to one of the two water-taxi terminals (Caye Caulker Water-Taxi or the San Pedro Water -Taxi. They are competitive and equally good.) The water -taxi trip to the cayes is an exciting experience. Just make sure you can get the last water-taxi out of Belize City at about 5:30 p.m.
Want to get there by Bus? If you are travelling in-land to San Ignacio or Orange Walk, or to Dangriga (or Hopkins Village) or Placencia on the coast, when you land at the airport, take a Airport Taxi to the main Bus Station in Belize City. If you get there before dark (around 6 p.m.) you should be able to get a bus without much trouble. If you want to get to Punta Gorda, you might have to wait till the morning, in which case you might have to overnight in Belize City. 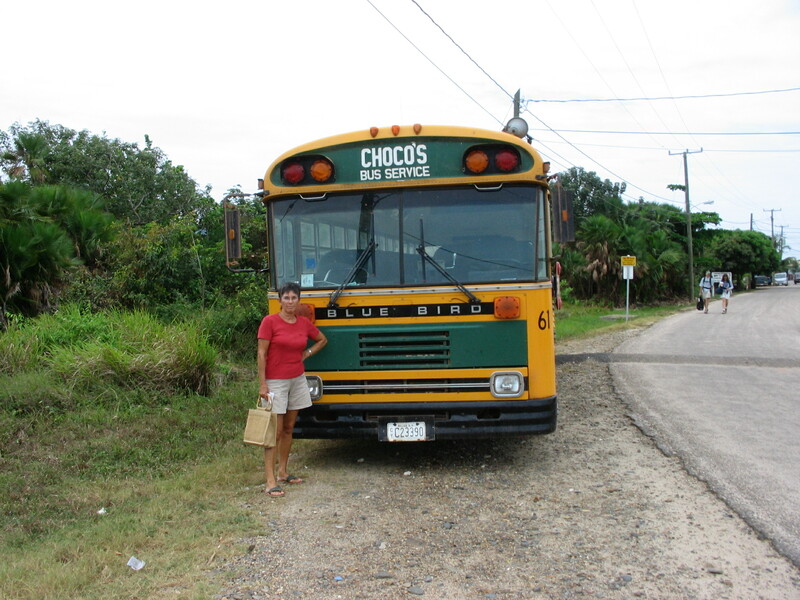 What’s bus travel like in Belize? Keep in mind, Belize was a British colony before independence in 1983. When you think of the Brits as colonizers you must have thoughts of ‘time-tables’, ‘schedules’, ‘queues’ and the absolute importance of a bus or train to leave and arrive on time. I can’t hold the bus lines in Belize to such a high standard; they are privately not publicly owned and compete for business driving hand-me-down Blue Bird school buses, but based on personal experience the Brits passed on their DNA to their Belizean successors when it comes to travel by bus and you can expect reliable, on-time transportation. And, anyway, what’s life if it isn’t an adventure. 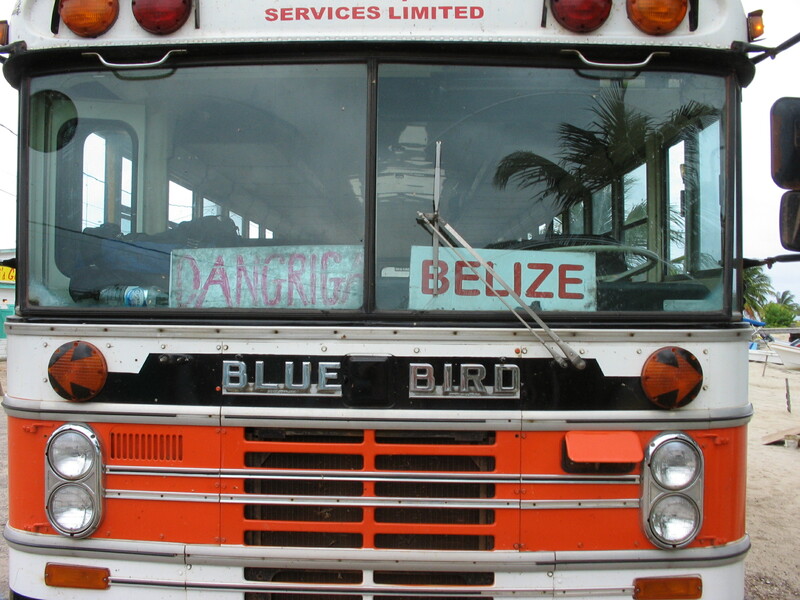 Let me give you a ‘for example’ scenario: one of our favourite bus rides is from Belize City to Dangriga. 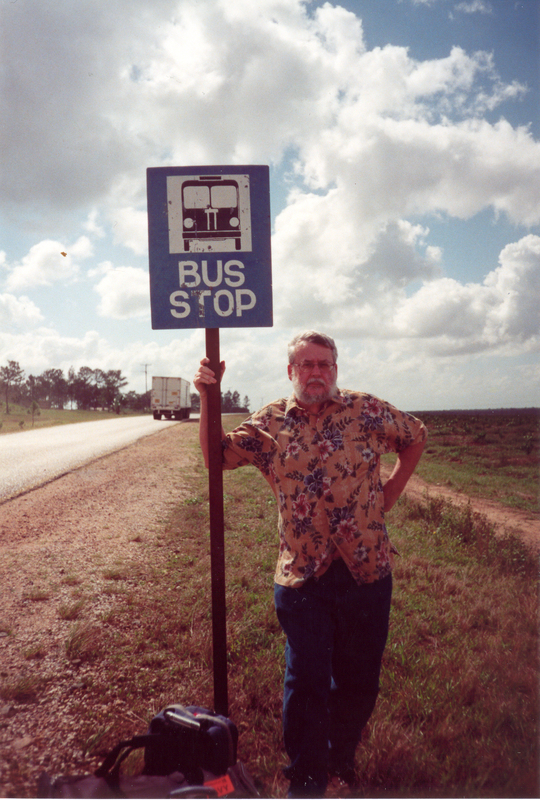 You have to dis-embark in Belmopan, the capital of Belize, but you won’t have to wait long for a bus to Dangriga. Then you are headed for the Caribbean Coast down the Hummingbird Highway, a paved road that winds up and over the foothills of the Mayan Mountains, lush rain-forests punctuated by small towns and villages and acres of orange plantations. Sit back and let the air through the window sing you lullabies. ( I should mention that there are toilet facilities in all main bus stations but you have to pay the attendant a nominal sum. But once you have paid the piper you can call your own tune. Make sure you have some small change with you. You can also buy food at most stations, from potato chips to hot dogs, and you can replenish your bottled water supply if need be. When you reach Dangriga, if you plan to make a connection to some of the well-known cayes such as Tobacco Caye and Glover’s Caye, take a taxi (3-4 $ usd) from the bus station to the departure dock for these destinations and wait for your boat to arrive. If you want to get to Hopkins Village from Dangriga either pre-arrange with your host for a pick-up at the bus station or take your chances getting the last local bus from Dangriga to Hopkins. If you miss the last bus, you will have to stay overnight but that’s okay as long as you can get a room at the Chaleanor Hotel, my favourite hotel in Dangriga. Ask for Chad, Eleanor or Chad Jr. and tell them Brian from Canada sent you. One last thought, if you prefer to be picked up right at the airport, contact Tosh and Danielia, a dynamic mother/daughter combo operating out of San Ignacio at www.cayoshuttle.com and one of them will be at the airport take you down the Humming Bird highway to Dangriga at about $120 usd for two, $25 extra each for more than two. Whatever you decide to do, enjoy it. And come back to the Chez Belize any time you wish. This entry was posted on Sunday, June 24th, 2012 at 4:48 pm	and posted in adventure, Travel. You can follow any responses to this entry through the RSS 2.0 feed.